The definitions from the International Valuation Standards, eighth edition (2007) are reproduced with the permission of the International Valuation Standards Council who owns the copyright. No responsibility is accepted by the IVSC for the accuracy of information contained in the text as republished, the English version of the IVSC Standards as published by the IVSC from time to time being the only official version of the IVSC Standards. Ownership is a real right that cedes absolute control over a specific property. An owner is entitled to possess and occupy his property. It is, however, possible to possess a property and not occupy it, and to occupy it and not possess it. Two interesting points is, firstly, both possession and occupation requires some form of physical control whether directly (physical occupation) or indirectly (owner has the keys to the property). Secondly, the difference in terms of these is the possessorís intention to be the owner while the occupierís intention is to gain some benefit from occupying the property. In order to understand the network of rights in property, an organizational chart delineating the different types of rights would assist in this process (see Fig. 1 below). 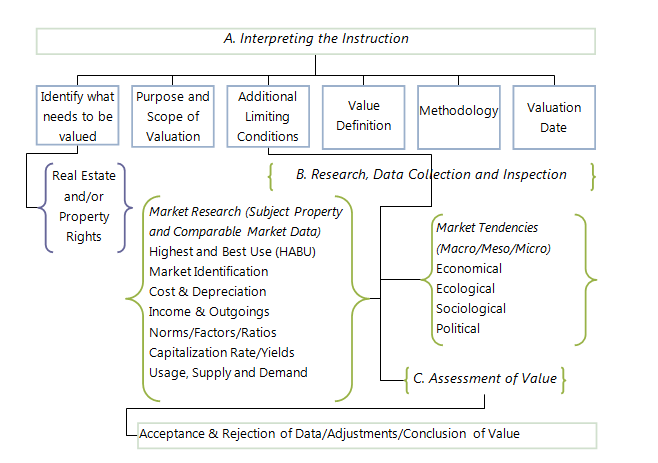 In property valuations there are 5 generally accepted methods or approaches to value. These are the Sales Comparison-, the Income Capitalisation-, the Depreciated Replacement Cost (DRC)-, the Residual-, and the Profits method. I recently attended a conference on green buildings and sustainability and I would like to mention four learnings that I took away. Some of it celebrates achievements, some of it is critical, some is a collection of (hopefully) interesting facts and statements, and some, well, just illustrates how blond one can be at times. Do you want to know the blond part first? Okay, you twisted my arm. By the way, I mean no disrespect to people with blond hair, I’m just lazily borrowing a steoreotype. For lunch on the first day, and when they eventually set all the hungry people free, everyone including myself ran like never before to get first to the lunch stalls (we don’t care if you don’t get any food as long as we have – survival is the fundamental human need; I’m just quoting Maslow’s hierarchy of needs, that’s all). As we rush into the exhibition area looking around for food I see people eating delicious foodstuffs, but I don’t see where they get it from. So not to look too desperate and hungry, I decide to casually stroll around the exhibition area and hopefully come across the food stalls. As I’m walking with one hand in pocket showing no physical signs of malnutrition and deprivation of liquids, I spot a group of people at some cooldrink stalls but alas, no food stalls. I join the line and non-chalantly asks the server behind the counter: “Are these cooldrinks complimentary?” To which he replies: “Yes, sir, what would you like.” I indicated the Ginger Ale and strolled off. Property should be viewed from both a macro and micro perspective, taking into account the big picture and micro activity within the suburb or immediate geographical area. For example, the general demand and future (improved) rights within a property zone over the next 5 years. It makes me think of a patient asking a medical doctor whether a tumour is malignant before a biopsy is carried out. In both instances it is recommended to carry out tests and analyse certain facts before stating, what may appear to others to be a quick and easy conclusion.